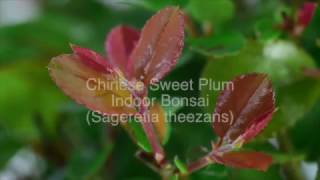 Sweet Plum Premium Range Fruiting Indoor Bonsai Tree. A highly refined bonsai with lovely foliage pads and lovely trunk flow. Potted into a pretty turquoise oval pot with matching drip tray. Potted into a lovely cheerful turquoise oval pot with matching drip tray. * Pot details: Fresh turquoise glazed oval ceramic bonsai pot.